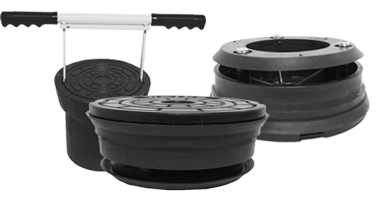 Non Pop Lids are the permanent replacement for conventional cast iron valve box lids. Constructed of high-impact Fiberglass, reinforced Nylon and Dead-Bang™ Rubber, Non-Pop Lids prevent movement and roll-out while reducing the road noise normally associated with cast-iron lids and bases. These lids are an ideal solution for eliminating noise complaints in residential neighborhoods as well as limiting liability costs often associated with roll-out or pop-out problems. 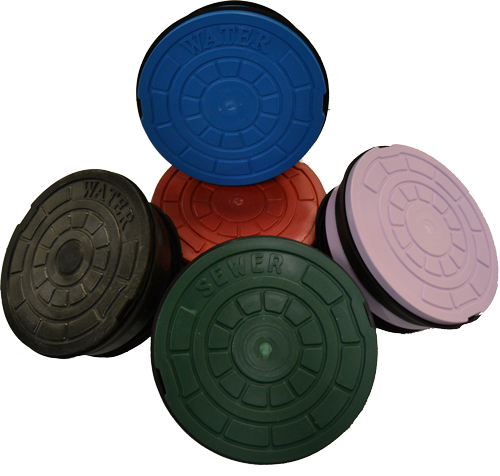 SW Services' Non-Pop Polymer Lid is made of high-impact Fiberglass reinforced Nylon and Dead-Bang™ Rubber which not only prevents movement, but reduces road noise by preventing the conventional "clank" associated with a cast-iron lid and cast iron base. Reduced noise will result in fewer complaints, particularly in quiet, residential neighborhoods. The main body is constructed of high-impact, fiberglass-reinforced nylon, which was selected for its durability, impact and UV resistance. The rubber retention seal is an ozone and chemical resistant thermoplastic Elastomer composite (Dead-Bang™ Rubber). Both materials are of premium quality and are designed for years of service in ground-level applications, including high-traffic areas. Lids are capable of operating at temperatures in excess of 250º F and are highly resistant to UV light, Ozone, Hydrocarbon fluids such as oil, gasoline and brake fluid, antifreeze and all chemical associated with the roadway environment. 1. Helps prevent roll-out or pop-out problems normally associated with cast iron lids. Prevents accidents and helps avoid debris damage. 2. Cuts down road noise. 3. Lockout versions protect against unauthorized access. 4. Made from durable, light weight materials. 5. Easily locate buried Caps with optional 3M Locator Coil. 6. Customize your own color-coded systems.